The narrative after Charles OakleyÃ¢â‚¬â„¢s tour de force at the K1X store in Soho on Saturday was that heÃ¢â‚¬â„¢s a loose cannon, not afraid to speak his mind because, well, who messes with Oak? I was there for Dime Magazine, and that was the angle we took. It pretty much had to be. If you paid close attention, though, there was one topic Oak wouldnÃ¢â‚¬â„¢t talk about even when prodded: the NBA lockout. Logically, thatÃ¢â‚¬â„¢s because itÃ¢â‚¬â„¢s the one thing he thought he might actually get fined for speaking his mind about. But there was also a hint of underlying sadness Ã¢â‚¬â€œ perhaps Oakley couldnÃ¢â‚¬â„¢t talk about the lockout, but it also seemed as if he simply didnÃ¢â‚¬â„¢t want to, since it didnÃ¢â‚¬â„¢t come close to representing the ideals he always applied to his chosen profession. In recent days, weÃ¢â‚¬â„¢ve heard vague updates about 15-hour negotiation sessions that should have happened three months ago, with gag orders so as not to let anyone know the more brutal details of the avarice that is choking the life out of the NBA season. 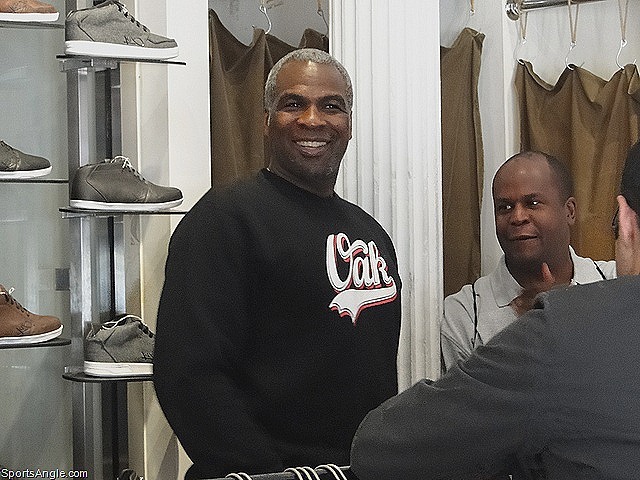 Then you have Charles Oakley, who stands up like a man and tells literally everything like it is. The contrast is stunning, and reminds us that OakÃ¢â‚¬â„¢s brand of honesty and reality is still relevant today, because itÃ¢â‚¬â„¢s emboldening to know that thereÃ¢â‚¬â„¢s anyone that can still do that. OakÃ¢â‚¬â„¢s comments at K1X set off a bit of a sensation in recent days, primarily because weÃ¢â‚¬â„¢re not used to hearing anyone even come close to eschewing political correctness. So when Oakley says he doesnÃ¢â‚¬â„¢t think Erik SpoelstraÃ¢â‚¬â„¢s a good coach, or jokes that heÃ¢â‚¬â„¢s going to pound Isiah Thomas for his transgression of ruining the Knicks, itÃ¢â‚¬â„¢s refreshing. Sitting with Oakley on Saturday was like meeting up with an old friend. Though IÃ¢â‚¬â„¢d never met him before, I loved watching Oak back in the day. HeÃ¢â‚¬â„¢d toss bounce passes to Spike, then hoist up 18-footers Ã¢â‚¬â€œ and generally hit them Ã¢â‚¬â€œ on the first possession of every Knicks game. Never failed. Oakley was the anti-Jordan in his day, getting over with grit, drive and humor while possessing a vertical leap probably less than what I had. I couldnÃ¢â‚¬â„¢t fully relate to JordanÃ¢â‚¬â„¢s excellence growing up, and though I likewise didnÃ¢â‚¬â„¢t have anything resembling OakÃ¢â‚¬â„¢s toughness, I could at least aspire to be as gruffly cool as the Oak man. Plus, I couldnÃ¢â‚¬â„¢t emulate JordanÃ¢â‚¬â„¢s jumper, but I could at least dive on the asphalt for loose balls. IÃ¢â‚¬â„¢ve discussed this before, but sports has become so sanitary as to become pretty much completely mundane. ThatÃ¢â‚¬â„¢s why Oakley is beloved still, even among people too young to have watched him play: HeÃ¢â‚¬â„¢s a throwback to a time when athletes didnÃ¢â‚¬â„¢t need to be afraid to show character and personality. They used to be free to be themselves without fear of the backlash that has made LeBron James, NikeÃ¢â‚¬â„¢s would-be scion of Michael Jordan, persona non grata. HeÃ¢â‚¬â„¢s also a reminder of a lost time in New York City, when the Knicks belonged to the people. IÃ¢â‚¬â„¢ve made no secret of my enmity for the idiot businessmanÃ¢â‚¬â„¢s son who insists on putting his horrible stamp on the franchise. Just listening to Oak talk about the players of his era compared to the current ilk brought me back to the Ewing-Starks-Mason-Oakley-Harper inartistic perfection of the mid-90Ã¢â‚¬â„¢s. (Obviously, you can keep Charles Smith.) They werenÃ¢â‚¬â„¢t pretty, they werenÃ¢â‚¬â„¢t flashy, but they were a team we could be proud of. We loved Oak in particular because he was honest, and because he was tough. No glitz, no glamour, just fuchsia suits and floor burns. Is he really going to pound Isiah Thomas, who surely deserves any roughing up he gets? Probably not Ã¢â‚¬â€œ but you never know. ThatÃ¢â‚¬â„¢s the charm of the Oak Man, the thrilling fantasy that he truly is the baddest dude in the business. ThatÃ¢â‚¬â„¢s the ideal we hold on to with Oak. He offers this sense that through all the nonsense in his sport — and in our everyday lives — you can be the toughest guy in the room simply by being true to yourself. And having that reaffirmed was, in my opinion, far more notable than anything he said — correctly — about AmarÃ¢â‚¬â„¢e Stoudemire.